I can’t pinpoint the exact reason why I grew attached to Yoshi (NES), but I love these puzzle, Tetris-like games, where you have clear the screen before it fills up. Yoshi was extra unique, as it had the mechanic of hatching Yoshi’s with a bottom shell, top shell, and the size of the Yoshi hatched would be determined by the number of Mario enemies sandwiched in between. This mechanic alone would serve great enjoyment, as the challenge would be to risk losing, while still trying to sandwich the biggest Yoshi possible. 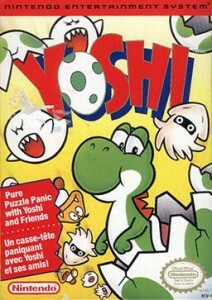 Besides the signature Yoshi hatching mechanic, the game also involved swapping columns in order to make matches to clear the board. I played the game so much that I got very good at making ‘last minute swaps’ in tight spots to keep myself alive, Although these types of games usually shine in the single player department, this also brought hours upon hours of multiplayer enjoyment on the NES with friends and family. Me winning of course. For me, this is not only one of my favorite games of all time, but maybe one of the most overlooked games in the NES library that should be remade for modern times with online multiplayer. I would be all over that!